Kerala, a state on India's tropical Malabar Coast, has nearly 600km of Arabian Sea shoreline. 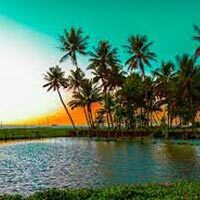 It's known for its palm-lined beaches & backwaters, a network of canals. Inland are the Western Ghats, mountains whose slopes support tea, coffee and spice plantations as well as wildlife. National parks like Eravikulam and Periyar, plus Wayanad and other sanctuaries, are home to elephants, langur monkeys and tigers. Kerala, a state on India's tropical Malabar Coast, has nearly 600km of Arabian Sea shoreline. 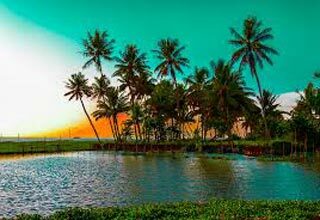 It's known for its palm-lined beaches & backwaters, a network of canals. Meal Plan Will Be On Cp (room + Breakfast). Meal Plan Will Be On Ap (room + All) Basis In All Houseboat. Houseboat Kotroo Palace, Srinagar HotelMeals Not Mentioned In The Itinerary. Mandatory X- Mas / New Year Eve Supplementary Charges. Arrival at Cochin & transfer to Munnar .Munnar (1800 mts above sea level) the place of South India's highest peak (Anamudi-2695 mts). You will visit Valara & Cheeyappara waterfalls .On arrival at Munnar transfer & check-in at the Hotel. In the afternoon visit Rajamala (Eravikulam National Park ), the best place to see Nilgiri Tahr the mountain goat of South India & Tea Museum. In the evening have a short visit at Munnar town. You can see the beautiful tea estates like a green paradise. Overnight stay at Munnar. Day 3rd aftemMorning have healthy breakfast at the resort, later check at the resort & drive to Thekkady. 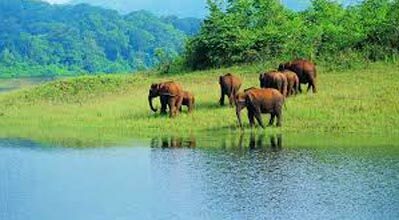 Thekkady is the location of the Periyar National Park,a world famous wildlife sanctuary. On arrival check-in at the Hotel & in the afternoon proceed for a game viewing cruise on the Periyar Lake. Here you will be able to see a large variety of wildlife’s, such as elephants, monkeys, deer, wild boar etc. In the evening you can take an Elephant ride at Periyar Wildlife Sanctuary and spend rest of the day in leisure. Day 4th After your healthy breakfast check-out from the hotel and transfer to houseboat. Around 1200 hrs check in at the Houseboat and start your cruise through the rich and splendid backwaters. Just relax at the deluxe houseboat. It will be a unique and exclusive experience of your lifetime. You will be cruising along the village sides and paddy fields witnessing the core life of the Kerala villages for the whole day. The house boat is fully furnished with bedrooms and a kitchen. Have dinner and spend overnight at the houseboat. Day 5th (Alleppey - Kovalam) - After your healthy breakfast check-out from the hotel / houseboat & transfer to Kovalam. Check in at Hotel. Kovalam is an evergreen and pleasant climatic beach resort. Kovalam is a dreamland for tourists all over the world. With high rock promontory and a calm bay of blue waters, this beach paradise creates a unique aquarelle on moonlit nights. Kovalam was brought in the limelight by the Maharaja of Travancore. Over the past three decades, the place has been well developed, and now figures prominently on the world tourism map. The warm and clean atmosphere by the coconut trees and the white sand bed are perfect for relaxing holidays, as the sea breeze gently plays with the waves. Relax at the hotel and overnight stay. After your breakfast proceed for city sightseeing tour and overnight stay at the hotel. Morning have breakfast at resort & later check out at the Hotel and drive to Airport / Railway Station for departure. During local or national holidays or special events, peek seasons, on Sundays, and during religious occasions, certain facilities such as museums, churches, restaurants, sightseeing tours, hotels, and shopping may be limited or not available. Alternatives will be offered whenever possible. Bti Holidays cannot be held responsible for any closures, necessary itinerary changes or curtails for any reason. Please carry a valid identity proof (Passport, Driver's License PAN Card etc. Check-In time is 12:00/1400 hours and the Check-Out time is 10:00/1200 hours. Early arrival and late departure are subject to availability of rooms.